Discover what you can do in Trani while being here, besides visiting the wonderful shops and trendy clubs there are lots of places of historical, artistic and cultural interest located only a few steps from our hotel. The harbor of Trani, which hosts our hotel, is a destination to several visitors. This place is the town’s main symbol and the fulcrum of its economic and cultural development. Taking a stroll along the quay amidst colorful boats and traditional restaurants is definitely a must. Not far from the quay rises il Fortino di Trani (the Trani Fort) offering a panoramic view of the city and the well-known cathedral. A short distance from the Fort is Villa Comunale (Municipal Villa) where you can indulge in long walks across the pedestrian walkway flanking the sea. The villa’s most distinguishing features are its funny parrots which populate the trees and the garden pools are home to turtles and lots of different types of fish. 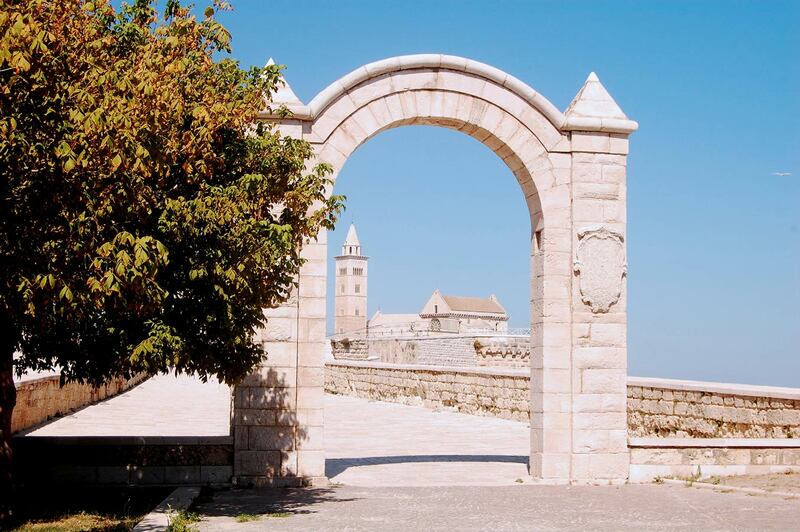 La Cattedrale di Trani (the Trani Cathedral) is the most renowned and visited place by first timers. The beautiful Church stands a few steps from the sea in a silent location conveying an even more suggestive and stately look. The cathedral was built with Trani’s classic stone: a wonderfully white-rose calcareous tuff perfectly matching the blue of the pristine sea. It is possible to climb the bell tower to enjoy a spectacular view of the sea and the city. Il Castello Svevo di Trani (the Swabian Castle of Trani) looking out over the sea and built by Emperor Frederick II of Swabia, rises not far from the cathedral in a location once considered strategic thanks to the presence of shallow sea bottoms which protected from the fury of the sea and possible attacks by enemy fleets. A must-visit for all who love history and architecture. Another place of interest is definitely the town’s ancient Jewish Quarter rising in Giudecca, a suburb in the eastern area of Trani directly connected to the harbor. Here were 4 sinagogues later converted into churches. Today tourists can pay a visit at: S. Anna Church in Via della Giudea and Scolanova Church in Via e Piazza della Sinagoga.